Easy to grow, brilliantly bright colors, blooms all summer. That’s the brief but boastful resume’ of the marigold. Marigolds are a popular plant to introduce to kids and beginning gardeners since a beautiful bounty of colorful blossoms can be produced with a minimum of effort. Start your marigolds from seeds indoors to get a jump on the summer growing season. Or, when the time is right for planting outdoors directly into your garden, expect to see a good supply of the ready-to-plant annuals available for purchase at your local garden center. A number of varieties can often be found but the two most popular seem to be the African and the French marigolds. The African varieties produce big blooms (4 or 5 inches across) on stems that grow up to 3 feet in height. The French marigolds are smaller (1 to 2 inch blooms on stems up to 10 inches) and generally have denser foliage. Although the blooms of marigolds are quite brilliant, they are somewhat limited in the actual number of colors available. 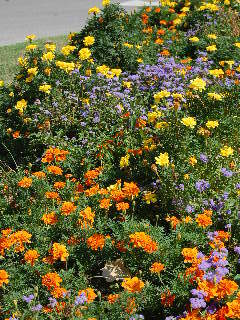 The African varieties are mostly orange and yellow, while the French marigolds are orange, yellow, red, with some variegated blossoms of mixed orange and red. Consider mixing other flower types that produce other colors (purples, whites, etc.) in with your marigolds to add more depth to your garden’s color chart. Be sure to read the information on the seed packets or the description on the containers of live bedding plants before you make your purchase. Often, combining the two varieties in your garden can be quite effective—the shorter and denser French marigolds on the borders and outside edges of your flowerbeds and the taller African varieties in the background. Clusters of the little French varieties are also great for filling flowerpots and window boxes. 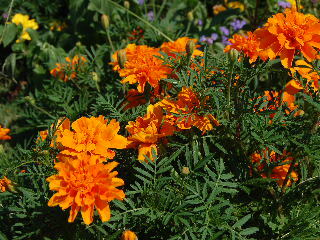 Plant your marigolds in a good loose moist soil. Be sure they are located in a setting that gets plenty of sunshine in order to produce maximum number and size of blossoms all through the warm summer growing season. Give a couple of light fertilizer feedings along the way and be sure the soil doesn’t get completely dried out (mulching can help). Your marigolds should reward you with a continuous display of bright blooms right up until the frosts of autumn. Marigolds are just as famous for being good “companion” plants as they are for being prolific producers of their brilliant blossoms. Their pungent scent is said to repel harmful insects that might otherwise infiltrate your garden and eat your desirable plants. Planting marigolds in conjunction with your tomato plants is believed to be helpful in controlling harmful nematodes in the soil. Maximum benefit is gained by planting the marigolds rather thickly in your garden and then tilling the plants into the soil at the end of the growing season. Once established, marigolds are very undemanding and are generally quite hardy and unaffected by pests or disease. The exception is slugs that, if present, seem to enjoy munching on marigold foliage. One of the better-known slug eradicating methods is to put a small open container of beer or any other sweet-scented liquid into your garden with the top of the container level with the surface of the ground. Slugs will be drawn to this, fall in, and die an intoxicatingly happy death. Empty and refill the container every couple of days. On a lighter note, the colorful blooms of marigolds are said to appear even brighter to the eye of the gardener when said gardener sips a bit of red wine while strolling about in a garden ablaze with the brilliant fire of those orange, red, and golden blossoms!